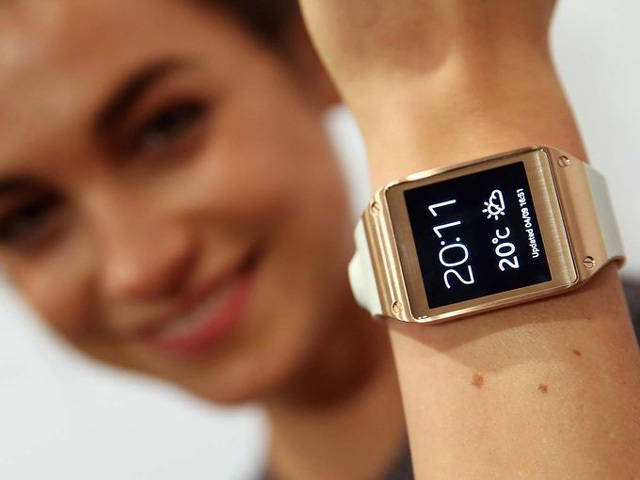 I wanted to defend Samsung's new smartwatch, the Galaxy Gear. When I saw it announced yesterday, my initial instinct was to start trumpeting: Yes! Brilliant! Innovation! Maybe I reacted that way because there is no category of technological devices more universally mocked by professional gadget reviewers than the computerized watch, and their universal derision attracted my inner contrarian. Maybe it's because I felt I'd been overly dismissive in my last piece on the history of smartwatches and given short shrift to the advances that have been made in wearable computing over the last decade. Or maybe it's because I started wearing a Jawbone Up band — a wearable computer of sorts — a few weeks ago and have enjoyed it so far. Still, I couldn't rationalize a defense of the Samsung smartwatch for one giant, insurmountable reason. Namely: The wrist is a terrible place for a computer. There's nothing especially offensive about the Galaxy Gear in particular. At $299, it's essentially an expensive Bluetooth add-on. You can use it to read incoming messages, make calls without pulling out your phone, take grainy photos, and use specially designed apps like Evernote and RunKeeper to do things like track your exercise and hold your to-do list. Some of the problem with wrist-based computing is related to the small size of the canvas. My wrist, for example, has room on it for a watch of about 1.5 square inches (the Samsung watch has a 1.6-inch display), or 2 square inches if I don't mind looking like a Las Vegas pit boss. Two square inches is not a lot of space. It's enough to fit between eight and ten lines of twelve-point type, depending on the amount of space between lines. And it's too small to display web pages, render photos at any reasonable resolution, or allow anything but the most basic two-finger multi-touch gestures. And the one-handed nature of smartwatch use means that typing anything on a screen is going to be a hunt-and-peck exercise. But screen size isn't the ultimate limiting factor for smartwatches. A bigger hurdle is that the concept of an interactive wristwatch is fundamentally unappealing. As Matt Buchanan notes, wristwatches have always been passive display devices — you glance at them to see what time it is, but (unless you're setting an alarm or using a stopwatch function) you rarely have to do anything to it to make a watch work. Passivity is also how fitness bands like the Jawbone Up and the Nike Fuelband work. With certain models, you can look down to see how far along you are in your exercise goals, but to do any actual configuration or tracking, you have to connect them to a device with a larger screen. The wristwatch has always been a weird, ad hoc bit of technology. The original models represented a sort of early twentieth century lifehack — a novelty that allowed people to wrap the functions of their pocketwatches around an easily accessible piece of flesh, to make for easier viewing. The wristwatch was an artifact from a time when clocks were more scarce, and having one on your wrist could mean the difference between making your train to work and missing it. Now, of course, the date and time are everywhere. They're on our computer monitors, our smartphone lock screens, the crawling tickers on TV. If you're reading this right now, you have one clock within a foot of you, and probably more. The future of wearable computing, if it arrives, will be found in devices that free us from tactile input altogether. It will be computers that exist in glasses, that allow us to voice-command our surroundings, that connect our shoes and pants and belts into one giant, data-collecting technological exoskeleton. It will be computers that work with our natural movements, rather than simply putting a computer onto a body surface and requiring us to interact with it in the same old way. Yes, you can disrupt the wristwatch — putting a new spin on a 100-year-old technology. You could also disrupt the quill pen. But why? By Kevin Roose. We found it on NY MAG.